The legendary singer-songwriter of such hits as "Mandy" and "I Write the Songs" is looking mighty unusual these days, and quite alarmed i might add. 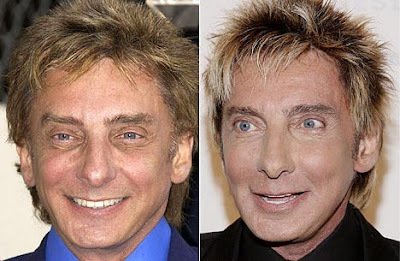 Just by looking at this before and after picture, you can clearly see that Barry Manilow had begun to let himself go, pretty badly in recent years, which may have prompted him to explore plastic surgery opportunities. The plastic surgery results really speak for themselves, possibly including an eye lift, facelift, cheek implants, facial fillers and a minor nose job. 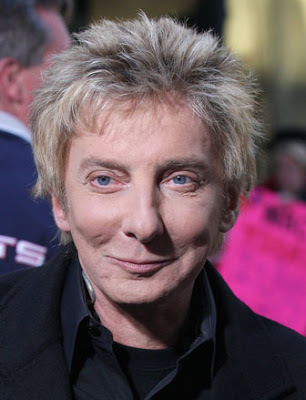 Did Barry Manilow go too far with all his plastic surgery procedures? He should have left well enough alone. Money can't buy everything clearly. Saw him singing in Nobel gala, he looked really plastic and unnatural. Feel sorry for him. Is it me or does he look a lot like Hillary Clinton now... only her facelift made her look better? I absolutely love Barry Manilow but I have to say, he looked better before the plastic look, why do so many celeb's feel the need to go through that? is it just that they have so much money they don't know what to do with it all? send some my way, i'll know what to do with it. He should have gotten a nose job in 1970 and then left it all alone. I, too, fail to understand why some of the celebs feel the need to alter their appearance so drastically when they were already beautiful and/or handsome. It would appear that Mr. Manilow also had his face "shortened", if that is the correct term, or the jaw line "shaved down"? Mr. Manilow, your music is beautiful and you have an incredible talent. Thank you.